Your fellow blogger Samantha here with an all new look into a new visit! One Hour was a place that I have heard about time and time again, and made this visit a few days ago with my friend, Johnson – who was convinced to take a visit here. 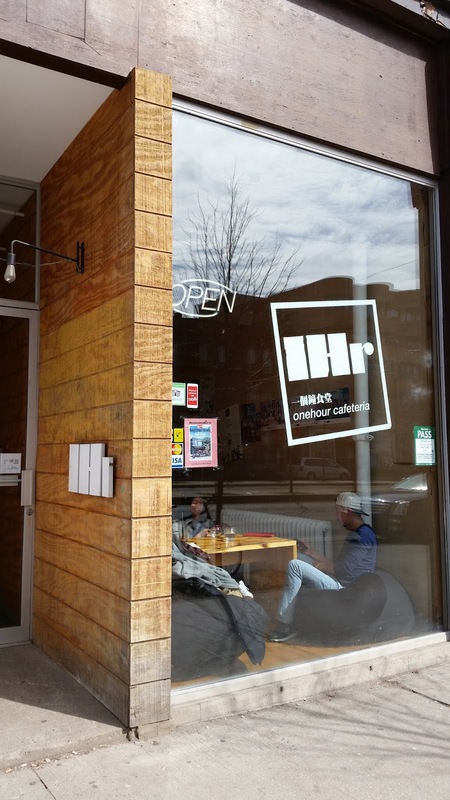 Completely low-key, and truly hipster like, this restaurant caters to all foodies, customers, and individuals alike – exceeding expectations in presentation, service and taste! One Hour is located on Spadina and College and is labeled as a walk in street cafeteria in the downtown core. 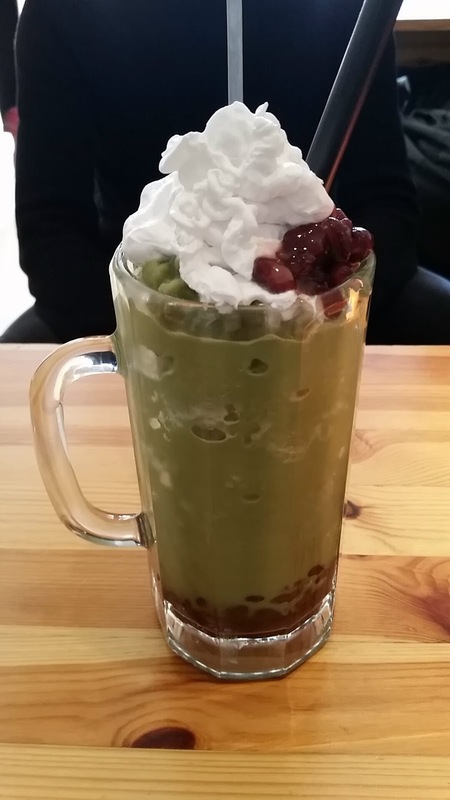 To start, Johnson ordered himself the Red Bean Matcha Slush, which was a beautifully made beverage of red bean, blended with matcha green tea, milk and ice, and topped with whipped cream to finish it off. The drink was the perfect sweetness, and had savory taste. The drink is a bit thick, so it could even play off as a dessert if you so desire. All in all, it was beautifully made and caters to all matcha lovers. 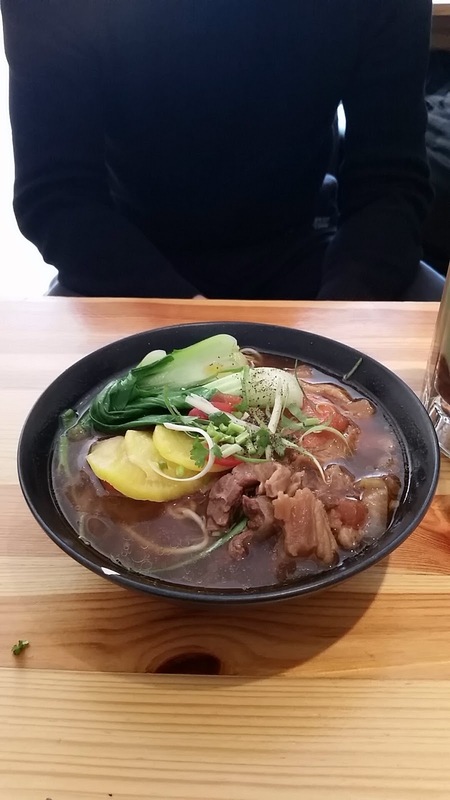 Soon enough, the first order of food came out for Johnson, which was Braised Beef Noodle – this delicious noodle soup consisted of beef shank and braised beef (of course) with hand made wheated noodles in a spicy broth. It was also served with Chinese greens and vegetables. Once again, One Hour did not fail to impress with a beautiful display, and on the account of Johnson, it was very tasty indeed. Now at this point my food came out (finally!). I ordered a lovely dish of Zha Jiang Noodles, which was minced pork stir fried with soybean paste, topped with grated cucumber, carrot and roasted peanuts. Mixed all together, it combined to make a very pleasurable dish packed with flavor. 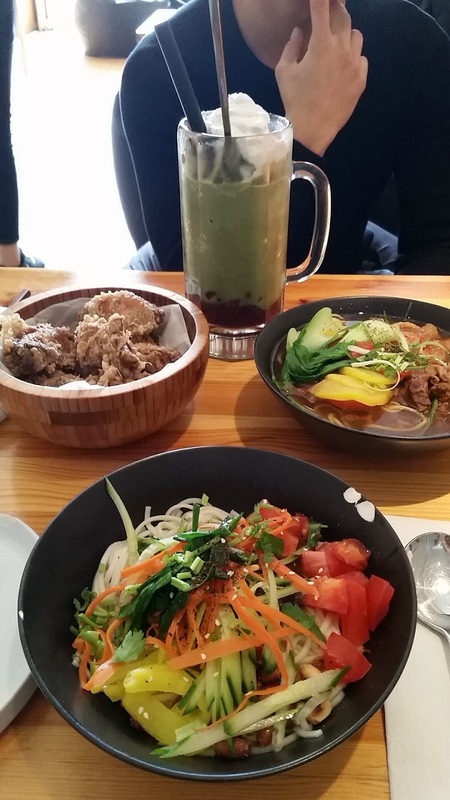 The taste actually reminded me a lot of the taste of black bean sauce you put in Pho to enhance the flavor – which emphasized the fusion of cuisines at One Hour. 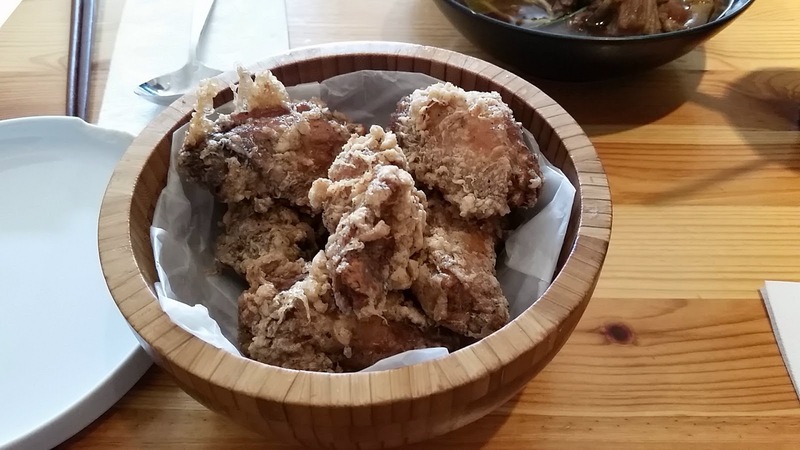 On the side, we also shared some Fried Chicken Wings which were crisp, hot and cooked very nicely, and clashed nicely with the main lunch that day as well. To end off the meal, both of us decided to treat ourselves to some killer dessert – because who can say no to something nice and sweet?! 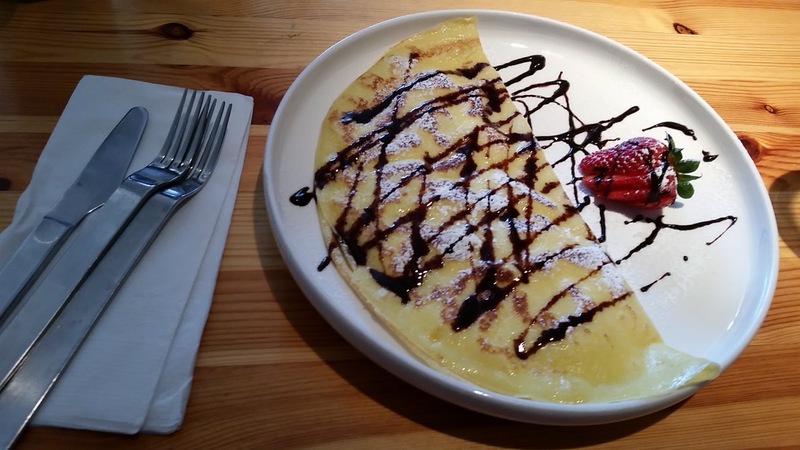 We ended up ordering a Homemade Custard Crepe which is One Hour’s signature custard prepared in small batches, dusted with icing sugar, drizzled in chocolate syrup sided with a strawberry garnish. Perfect way to end lunch! Overall, One Hour is definitely a recommendation for me if you want to have a laid-back lunch with a friend, or anyone for that matter. 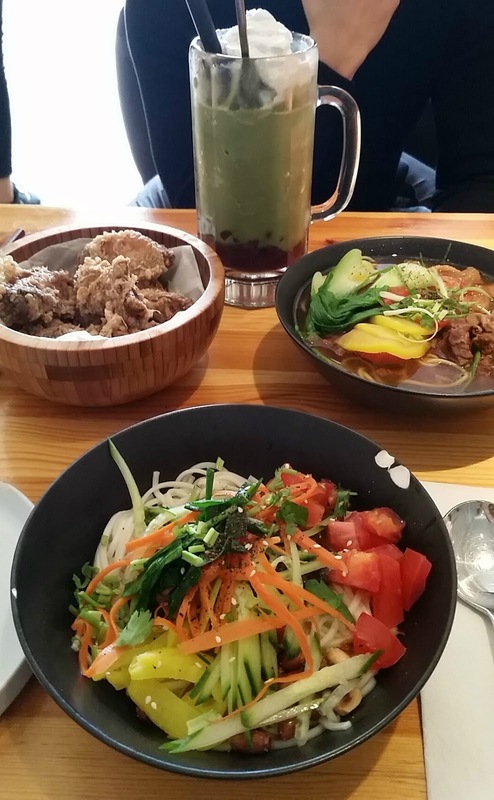 It is super convenient for students at UofT (just outside the peripheral of the campus!) and reasonably priced for such beautifully crafted food. The tastes are pleasant, and you end up leaving quite satisfied. My visit to One Hour was a smooth one, and I would definitely plan another trip to eat there again!